Telecommunications and media giant Bell is taking a stab at on-demand mobile television for customers without a cable subscription, as the number of Canadians quitting traditional cable TV continues to increase. Bell Canada's Alt TV service, launched Monday, allows subscribers to watch channels offered by Bell TV through the Bell Fibe TV app on their smartphones, tablets, or laptops, without requiring a cable box or even a television set. The service is only available to customers who already subscribe to Bell's Fibe high-speed home internet service, and will cost those customers an additional $14.95 per month. 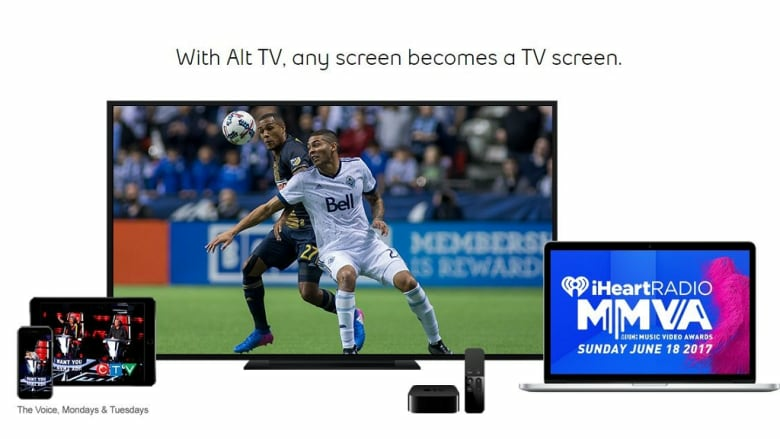 Users can also watch Alt TV on a television hooked up to a fourth-generation Apple TV device, with Android TV compatibility coming "later this year," according to a Bell press release. Alt TV is now available to "qualifying Bell Fibe internet customers in Ontario and Quebec," Bell said, and will be coming to Manitoba and Atlantic Canada. Alt TV is only available to Fibe internet customers with unlimited usage plans. The cheapest such plan, a Fibe 25 Unlimited plan, would cost $84.95 per month in Ontario at regular pricing, although it is currently available at a promotional price of $64.95, according to Rizwan Jamal, president of residential and small business services at Bell. "In terms of the target demographic that we're going after, they tend to be what I would call heavy internet users, and hence the perfect bundle for them would be an unlimited internet package as well as Alt TV, in our mind," said Jamal. Alt TV doesn't offer all the features of a full Bell Fibe TV subscription. Customers get access to a set group of about 30 channels, including major Canadian and U.S. broadcasters. A total of 500 channels are available to add to an Alt TV plan for additional cost. A $25 sports package includes TSN and Sportsnet channels, according to Jamal, whereas premium channels like HBO or The Movie Network would cost an additional $20 per month. Bell's Crave TV streaming service is also available as an add-on, Jamal said. Unlike subscribers to Bell's full Fibe TV service, Alt TV customers won't have the ability to pause live TV or record shows. Nor will they be able to watch TV on more than two screens at the same time. Ultra-high definition 4K TV is also not available to Alt TV users. "​Consumers don't need to worry about data usage or fees when viewing Alt TV at home," said Bell's press release announcing Alt TV. (Those consumers, however, would need an unlimited data plan to access Alt TV in the first place.) Viewing over regular mobile data networks would be subject to normal mobile data fees. That kind of statement about data usage could potentially land Bell in hot water with regulators, according to technology journalist Peter Nowak. An April ruling by the Canadian Radio-television and Telecommunications Commission declared that internet service providers can't exempt certain content from counting towards users' data caps. That CRTC ruling does not apply to so-called "managed services," or specific services provided through specially managed IP networks, rather than the public internet. "I'm not a network engineer, but as far as I can see, there's no reason why [Alt TV] should be a managed service at all," said Nowak. Bell believes Alt TV qualifies as a managed service, said Bell's Rizwan Jamal. "We feel very confident that this falls within those guidelines that [the CRTC] gave us," said Jamal. Bell does not currently plan to offer Alt TV as an over-the-top service that could be used by any internet user using any service provider, he said. "I do think that there are reasons to be excited about this package," said Daniel Bader, a technology analyst with tech website Mobile Nations, who described Alt TV as a potential alternative to much-derided $25 skinny basic cable TV packages. Still, Bader said Bell's requirement that Alt TV users subscribe to its Fibe internet service was "almost prohibitively restrictive." Bader also questioned Bell's decision to use the word "alt" in its branding, noting the parallel to the so-called "alt-right" political movement. "I don't understand how this passed muster, given that Bell has been pretty careful about what it names things, and is a pretty conservative company when it comes to getting noticed for the wrong reasons," he said. Bell's Rizwan Jamal said the name was partially intended as a reference to the "alt" key on keyboards, to appeal to a technology-oriented demographic. ​"I think that it really came down to a name that worked both in English and French, and also conveyed that it was different than your traditional TV service," said Jamal. Bell's new product comes at a time when more and more Canadians are avoiding traditional cable TV subscriptions. In 2016, an estimated 220,000 fewer people subscribed to such services in Canada, according to a recent report from Convergence Research Group. About 26 per cent of Canadian households did not have a cable or satellite TV subscription at the end of last year, according to the report. With the launch of Alt TV, Bell is following in the footsteps of its competitor Telus, which earlier this year launched a similar internet television product called Pik TV for Telus internet customers in B.C. and Alberta. Pik TV uses a $100 "media box" to connect to traditional televisions, but also allows viewing on a smartphone or tablet through a special app. Pik TV customers get 23 local and regional TV channels for $20 per month, plus a choice of five specialty channels. Additional channels cost $4 per channel. An earlier version of this story said Alt TV allows subscribers to watch Bell Media channels. In fact, Alt TV subscribers can access any channel offered by Bell TV, including those not owned by Bell Media.